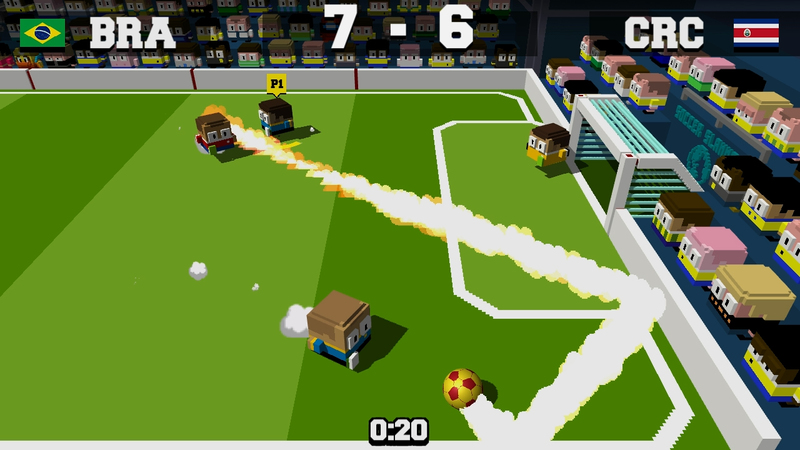 Soccer Slammers is an arcade style soccer game developed and published by Atooi. 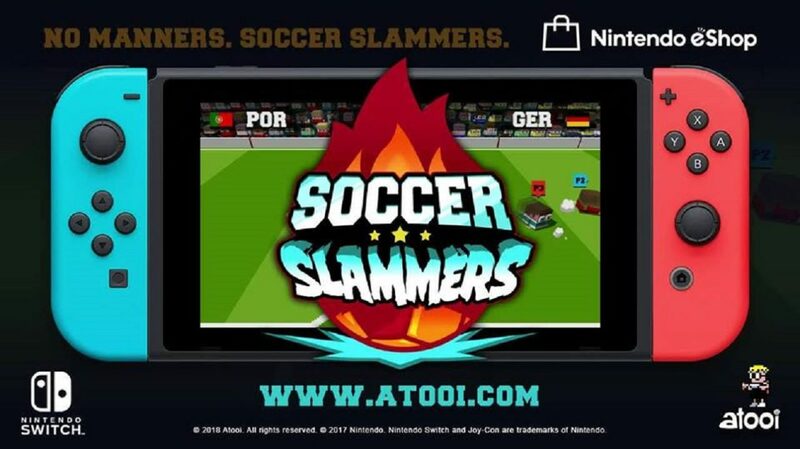 With games like Fifa and other arcade classics on the Switch is Soccer Slammers really worth your time? In short, Yes. I have to admit that I enjoy a sports title here and there, because they allow me to do the one thing I never was at sports, be good at them. When it comes to arcade style sports games I have to say I love them even more. 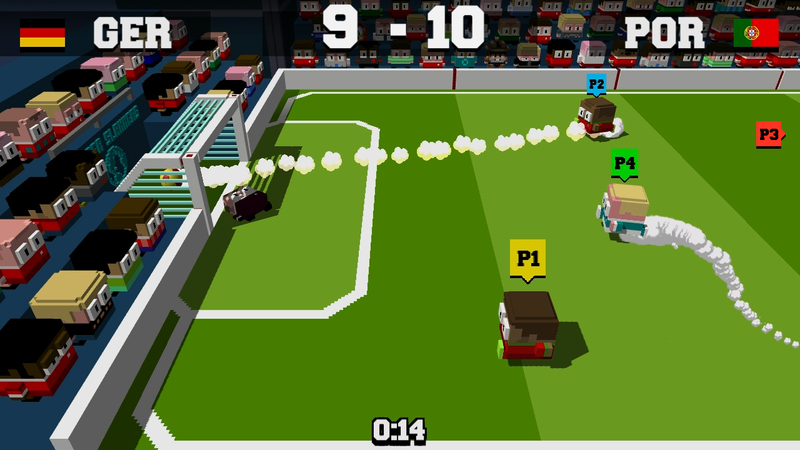 Soccer Slammers is no exception to that rule. It doesn’t offer a full soccer team–it is 2-on-2 with what feels like a useless goalie on each side. 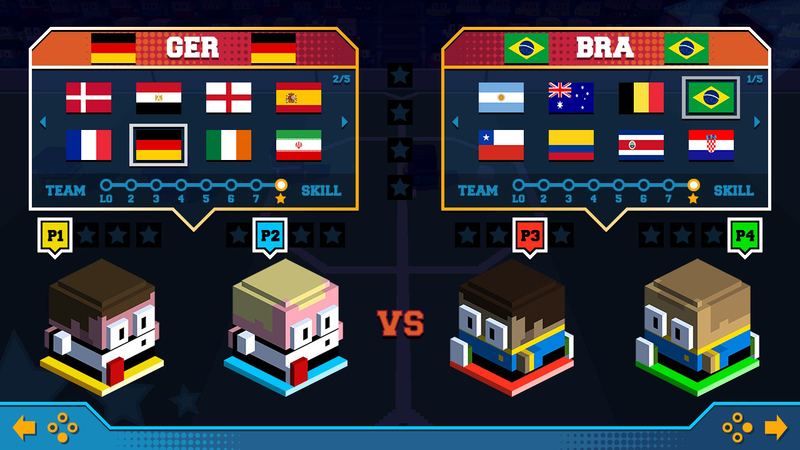 Players can select teams from many countries of the world. As a bonus, Team Mudd which allows you to play as Max from the Mutant Mudds games. Each team has a skill ranking from low to high. The skill level can be adjusted if needed in the Quick Game Mode. Speaking of modes, there are two of them: Quick Game and World Cup. Quick Mode is exactly what it says–it is it is a quick match that can be up to 4 players locally. World Cup is tournament style gameplay for 1 to 2 players. The controls are fairly simple: sprint, tackle, pass, and shoot. Using the tackle is a great way to steal the ball from an opponent but it also has its disadvantage of a short recovery time after every use. If you attempt to tackle and miss, it can leave the opponent wide open to score a goal. If you hold down the shoot button it powers up the shot making it faster and harder to stop. As mentioned above, the goalie at times feels useless, because sometimes a slow weak shot will roll right by him. Other times it would seem like he was slowly walking from one end of the goal to the other to stop a shot. Sometimes it just frustratingly felt like the goalie should have stopped more shots than what he does. Although I can’t say for sure, it might have been intentionally done this way. Each half is only one minute long. At first it didn’t seem like nearly enough time to play a game of soccer, but plenty can happen in 2 minutes. You can, if you would like, set the half timer to a longer setting of up to 10 minutes but I found the 2 minutes to be enough to enjoy the game. Honestly, it took me some time to start enjoying the game–it has a rather difficult learning curve. It took a long time to even tie a game let alone win one. Playing in multiplayer mode really helped me to learn some of the mechanics of the game a little better. It also helped show me how fun the game can be. The only error I encountered in the game was occasionally after scoring a goal there would be a slight delay before kickoff. It did not happen every game, nor did it really impact the game but I felt that it was something players should know. 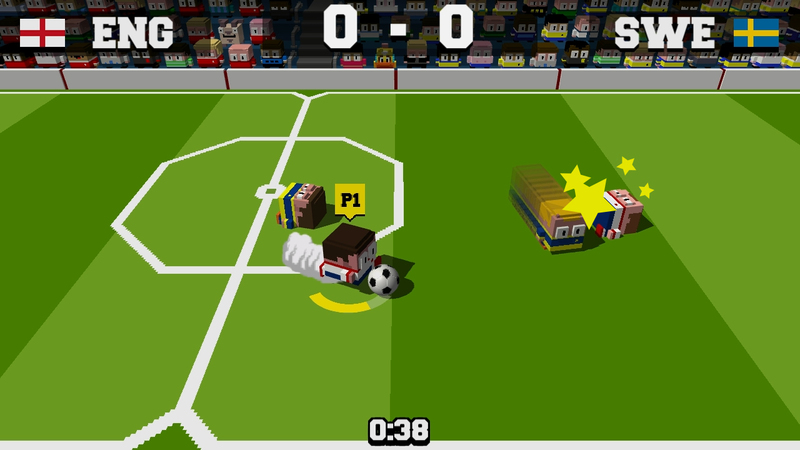 Although Soccer Slammers is a bit difficult, the game was still amazingly fun. Slammers proves that 2 versus 2 soccer in 2 minutes is more than enough time for plenty of action and excitement. If you enjoy arcade-style sports games, do yourself a favor and download this game. Once again, Atooi scores big. If you enjoy arcade-style sports games, do yourself a favor and download this game. Once again, Atooi scores big.